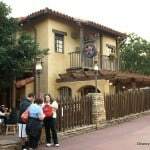 Frontierland at Magic Kingdom takes us back to the Wild West, when the railroad was just coming through and Big Thunder Mountain was nothing more than a mound of rock (or plaster). 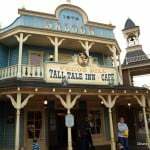 But today, as the railroad thunders on around the bend and hollowed out logs go splashing down into the Briar Patch, cowboys and cowgirls need more than their trusty pop-gun and sand, they need sustenance. 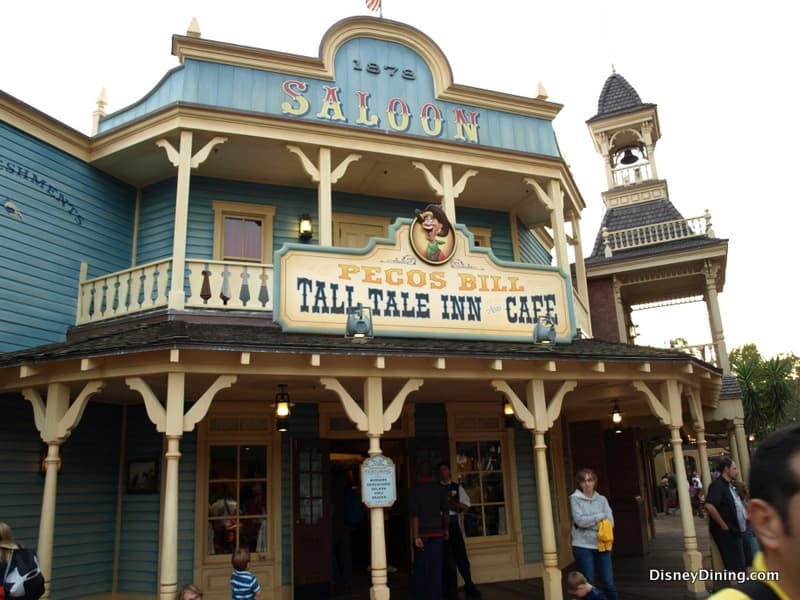 And if you’re anything like this reviewer, that sustenance could come from no other in all of Frontierland than Pecos Bill Tall Tale Inn and Café. 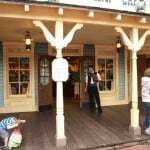 We rode into town through Liberty Square, the wooden stocks watching us like a Sherriff’s beady eyes, but we were on our best behavior. We just needed some grub. 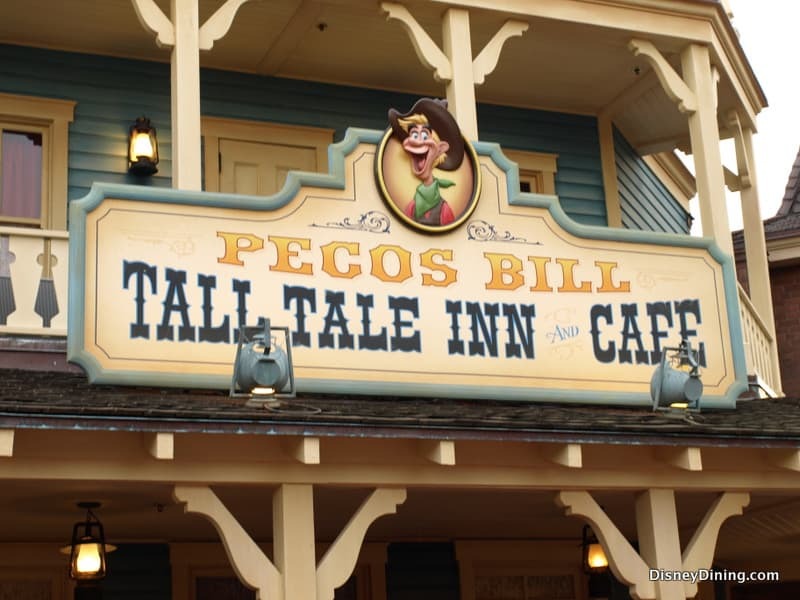 The turkey legs and the Frontierland Shootin’ Arcade along the road looked mighty tempting, but we were getting tired and Pecos Bill has always been known to perk up the hungry customer. Pushing open the doors, we were welcomed by the smell of fresh onions, tangy pickles, and the musk of cooked meat on the grill. 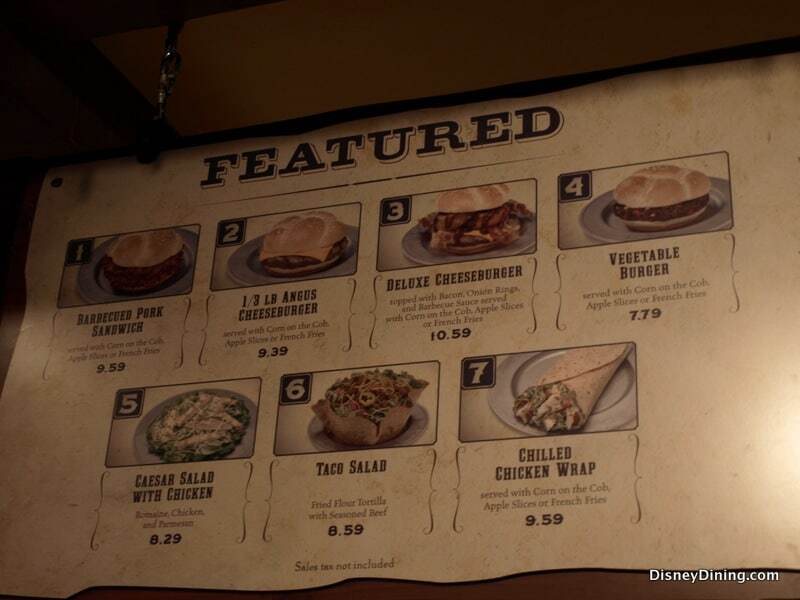 The buffet-style condiment and dressing bar was the first thing we noticed. Sautéed onions were sizzling in a pan on a hot stove, and various vegetables were tucked neatly into serving containers. This cowboy wasn’t expecting to dress his own burger, but it seemed more like a plus than an inconvenience. 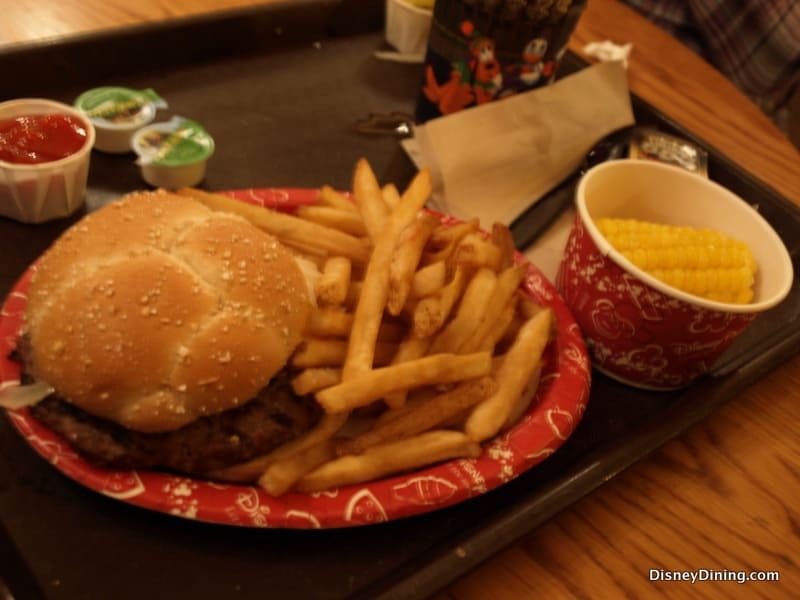 Most other customers were distracted by the parade that was about to start, so we hopped in line and made our order: 1/3 lb Angus Cheeseburger with Fries and Corn on the Cob. 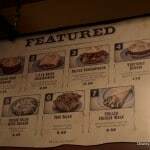 If we were going to be eating like cowboys, we were going to be eating heartily. 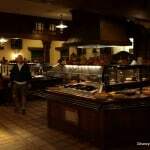 We rode through line fairly smoothly, grabbing our food and moving directly to the buffet table, where we topped our thick, juicy slab of Angus beef with sautéed onions, mushrooms, and your everyday fresh cut lettuce and tomato. 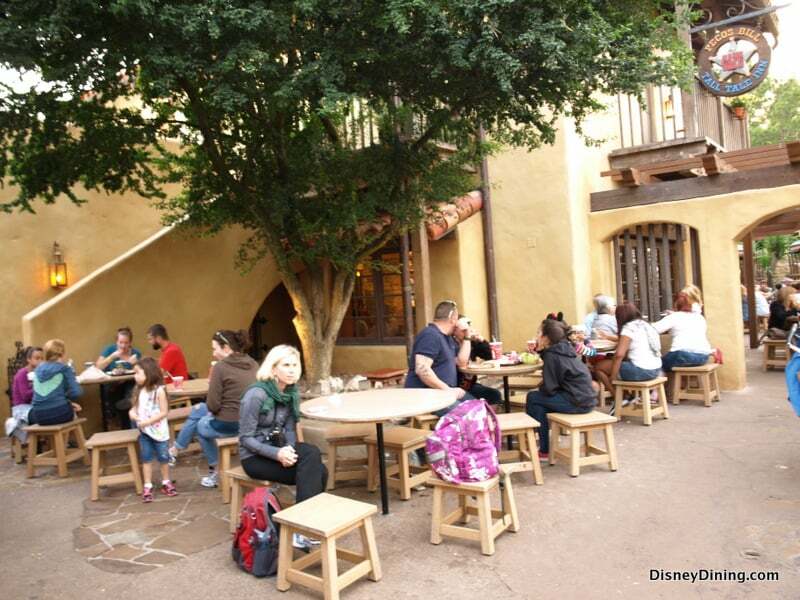 One of the unique aspects of Pecos Bill is various seating areas. 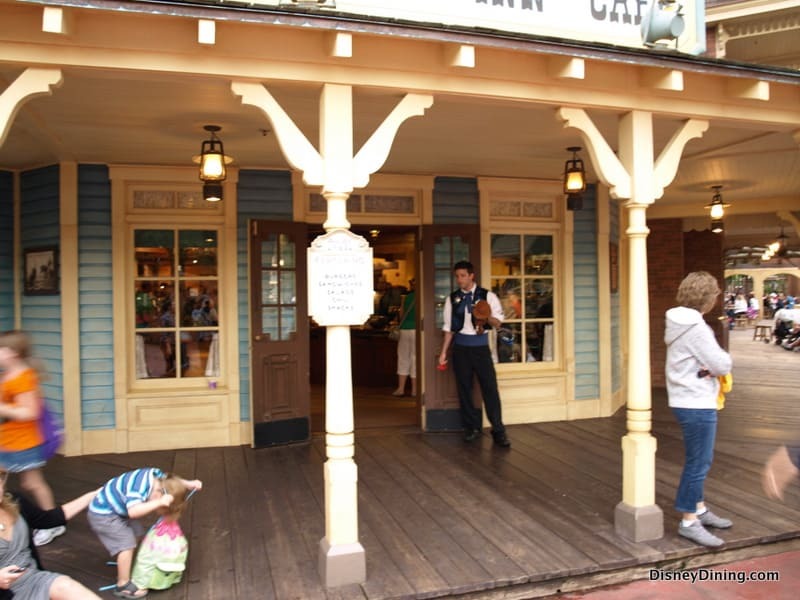 There are some outside at little tables along the main Frontierland sweep, everyday dining sections for those who just want to eat and go, but there are also rooms with more themed decorations, portraying a night sky complete with stars. 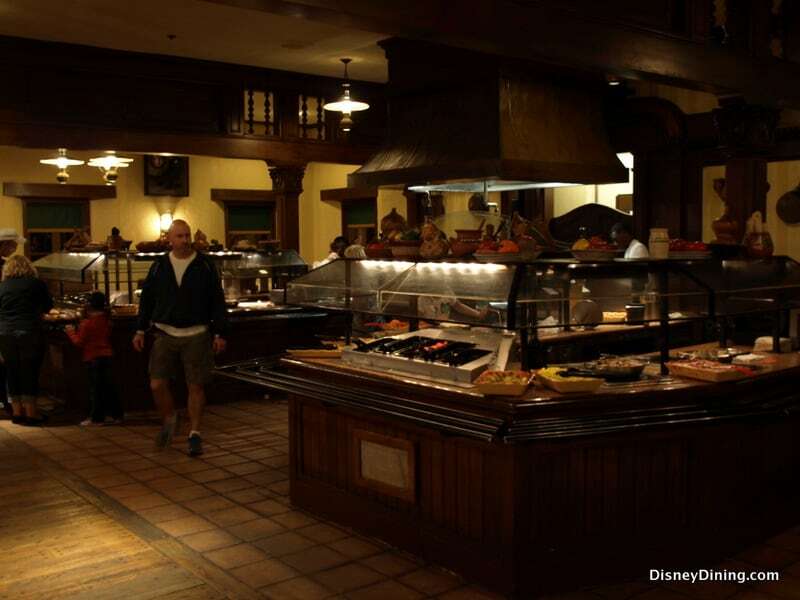 We wanted to get a glimpse of the parade going on outside, so we sat near a window in the main dining hall. But, despite the view, we were quickly distracted by our food. 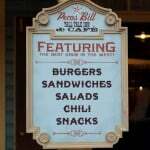 The burger tasted like it was prepared at a restaurant, not at a quick service joint. It was greasy and meaty with melted cheese stringing off of each bite, and the fact that we had made it our own with the condiment amenities made it that much better. 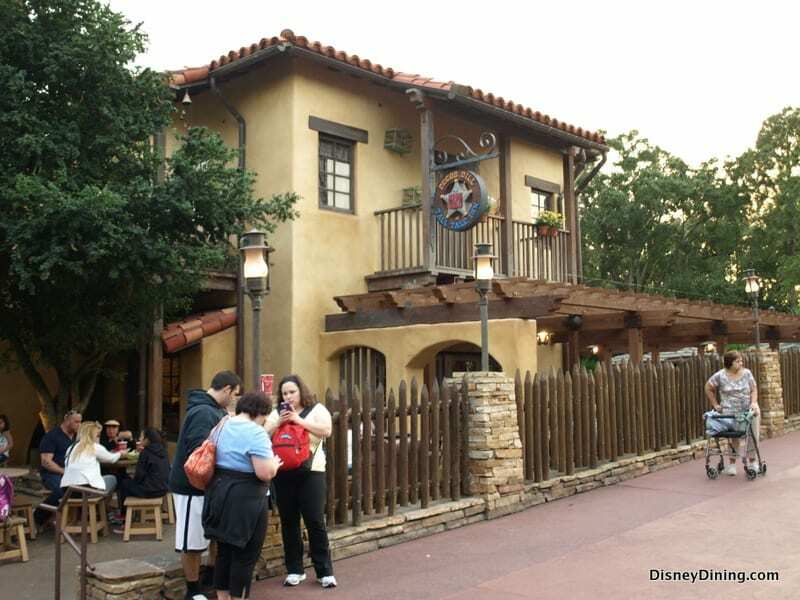 Each burger served at Pecos Bill is unique, because each one is dressed differently depending on what the customer wants. This was something we weren’t expecting, but definitely enjoyed. The corn was a bit soggy, but when you’re on the trail like we were, it’s hard to complain. Still, the fries hit the spot and the lemonade had us coming back for more. 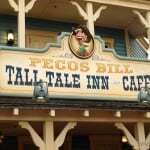 Pecos Bill Tall Tale Inn and Café has more food choices than most other quick service restaurants in Magic Kingdom, and provides everything from BBQ Pork Sandwiches and Angus Cheeseburgers to Vegetable Burgers and Taco Salad. 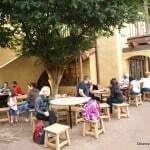 It was one of the only places this reviewer knows of that serves Chili, and the Carrot Cake looked divine, though we decided not to indulge ourselves. 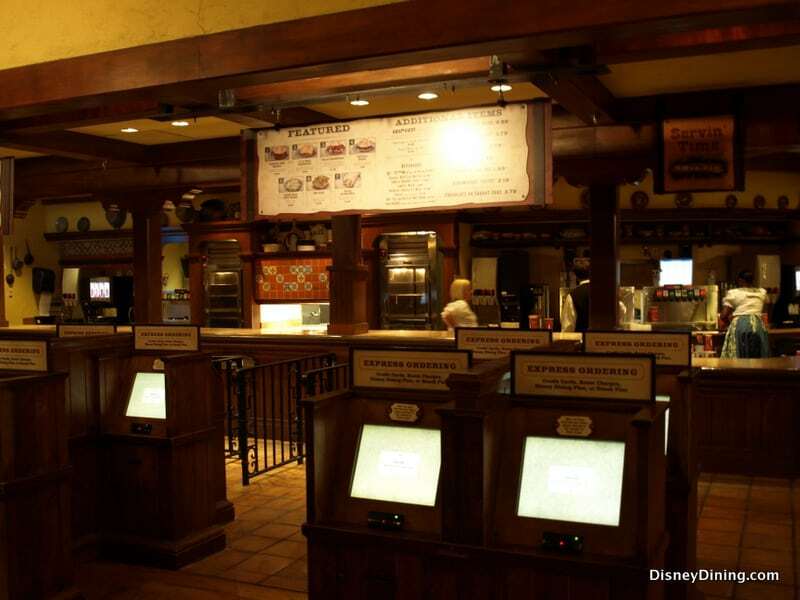 Chances are you will spend just about the same amount of money here as you would at any other Disney quick service, but the various selections give Pecos Bill a one-up. 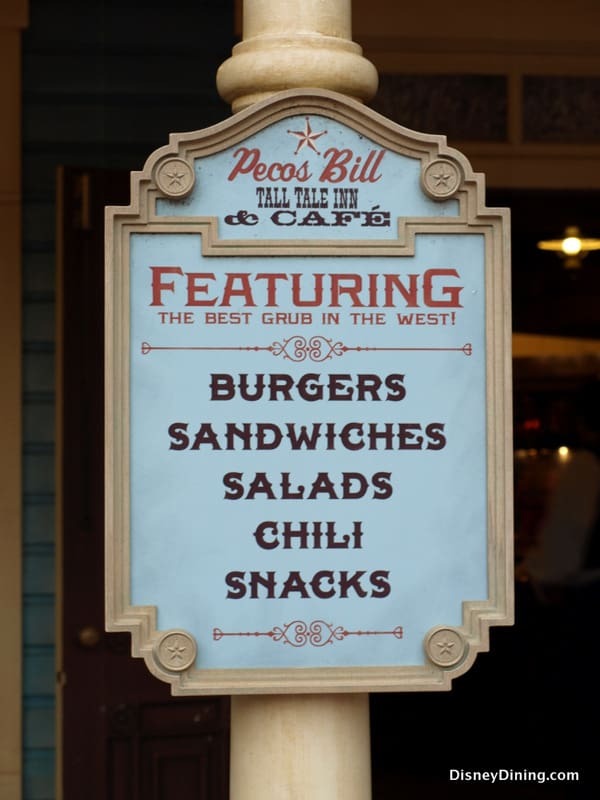 If ever you ride into Frontierland, and the grumble of tummies is hot on your trail, dip into Pecos Bill and fuel up on some good ol’ Western grub. You won’t regret it.